I spent some lovely time playing in my stash yesterday deciding what to take to my guild's retreat in Ocean City, Maryland this weekend. Retreat projects have to meet certain criteria. There can't be too many color changes or the need to check the chart constantly. This project, Sampler Houses by Brenda Keyes, has been my work-in-progress for some time, and it is probably the most perfect project for a retreat ever. Look at all those areas that need to be filled in with one color! Even the houses don't require much looking at the chart. I'm going to be working on the border of this piece tonight so that I can do more of the filling in over the weekend. This piece is a SAL with the duClay EGA and also on my 2017 WIP Challenge list there. 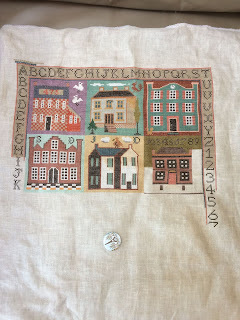 Only three more houses and the rest of the border to go!